The Canadian supplier I used for the LED’s was vendor “DIPMicro” on ebay, and the LED’s were about $0.20 apiece in a pack of 20. To mount the LED’s, I soldered four in series for each 14.4V flashlight, anode to cathode (the cathode is the side with the flat at the LED base), with about 1.5 cm between LED’s, and leaving one anode and one cathode at the end of each string for mounting to the base. Use an alligator clip or similar spring-loaded heat sink near the base of the lead of each LED during soldering to prevent thermal damage to the LED’s. 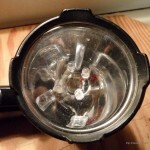 See the end of the post for what I did for the MagLite and the Duracell lamp. 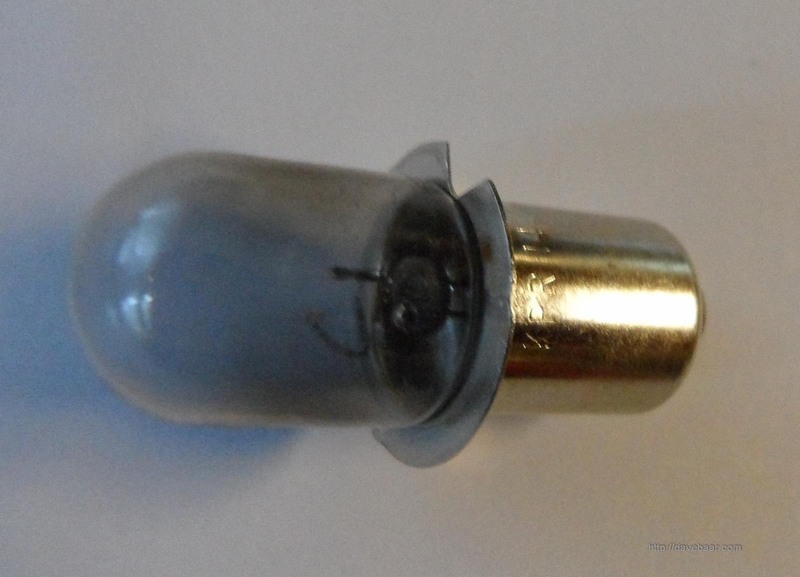 To get a bayonet base, I broke away the bulb glass from an old bulb using a pair of pliers (wear safety glasses when doing this in case of flying glass). 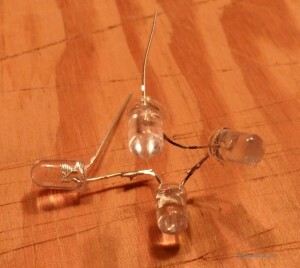 I soldered the open anode of the 4-LED string to the bulb centre conductor, and the cathode to the bulb base. 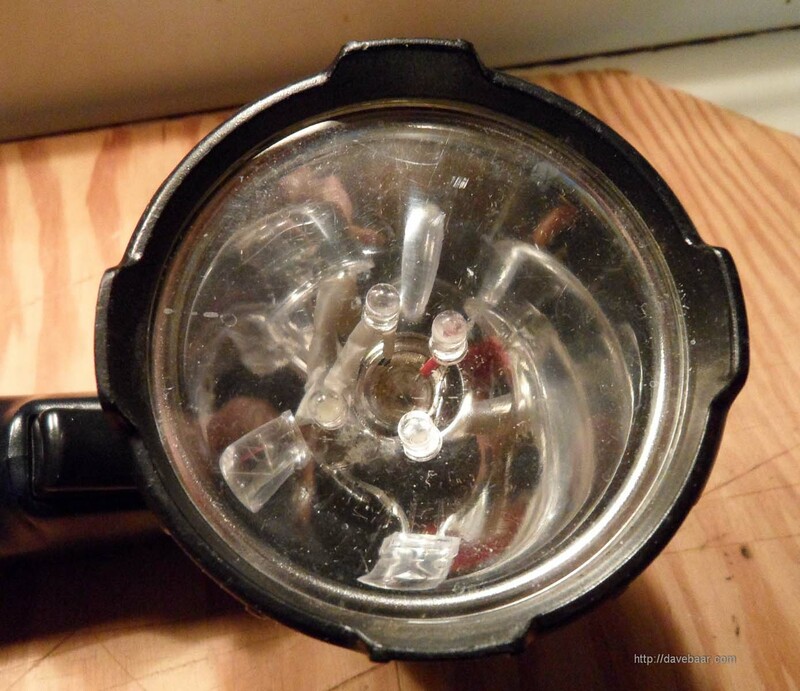 The V-shaped notch in the bulb base per the photo provided a nice path for getting the cathode lead past the circular hole in the flashlight mirror. 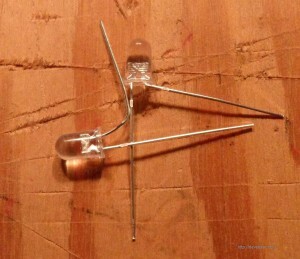 Edit March 5, 2012: One should add a series resistor to protect the LED’s in a usage such as this one. Please see the comments from user ‘Pennhaven’ below and links within for more details. Thanks, Pennhaven, for the great information. I used insulation stripped from old wire to insulate the LED string anode and cathode leads from the base. After assembly, I bent the LED string so as to have all 4 LED’s essentially facing forward just in front of the reflector. 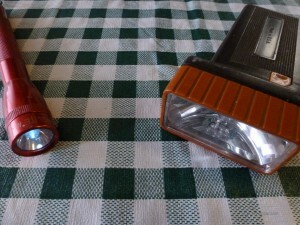 The end result was a flashlight of comparable brightness to the original, but with longer battery and lamp life. 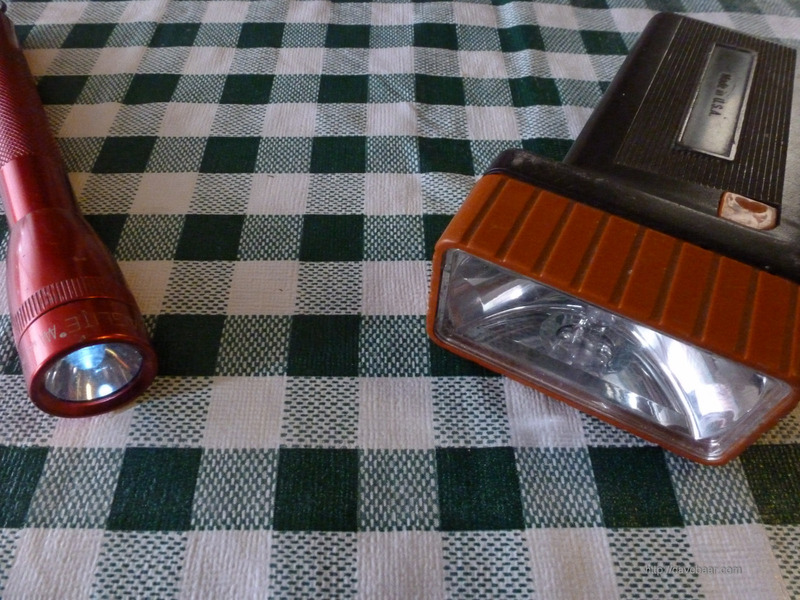 The new version is also less susceptible to bulb damage from mechanical shock. Had I needed more intensity, I could have added another string of 4 LED’s, paralleled with the first string, but that would have been tough to cram into the available space. Edit 2012 03 28: since I had some LED’s left over, I also converted a few smaller old bulb flashlights to use LED’s: a ‘MagLite’ that uses 2 AAA cells and a Duracell flashlight that uses 2 AA’s. In the case of the MagLight, I found I could just trim the LED leads and get it to fit in the existing pin sockets. I did have to drill out the hole in the reflector to get the LED to fit through it, but the plastic there drills easily. Works great, no soldering required, and has focussing too. In the case of the Duracell lamp, I found I could cram in 3 LED’s in parallel and got quite a bright light. In that case, I soldered the 3 LED’s onto an old bulb socket much like I had done above with the 14.4V lamp. Due to the 3.2V nominal voltage for those 2 flashlights, which is well below the max rating of the LED’s, I found I had no need of series resistors. As Bob Dylan said “Keep a good head and always carry a lightbulb”. Appreciate your posting. It was very timely since I had a similar project in mind for my own 14.4V work light and was happy to see from your post that it was feasible. Here is some additional info to help anyone else who might be interested in this. When searching for suitable LEDs my research led me to information about the advisability of including current limiting resistors in LED circuits. And also to this very helpful LED circuit design wizard. Note that the recommended resistor value would depend on the actual typical forward voltage spec for your LEDs. Very useful comment. I had considered adding a series resistor and might retrofit one after reading the linked page. Another reason to insert one is the variability of the battery pack voltage, due to decay as the cell is used and also internal resistance. The open circuit voltage of the battery pack looks to be around 16.5V when it comes fresh off the charger. That is probably a “safe” source voltage to use for the resistor calculations, particularly because 20mA is a very light load for such a battery pack and probably doesn’t draw down the voltage much below open circuit case. While the “super ultra brights” are twice as expensive, they put out more than three and a half times the light, which would be very welcome, since I can’t say that I’m thrilled with the output of the “ultra bright” ones I used. Usable but certainly nothing to brag about for a light with this much battery capacity. 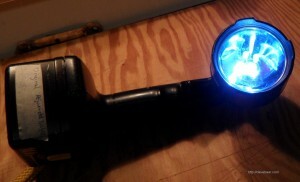 I also retrofit my old school 6 volt (lantern battery) floating flashlight. I used four of the same ultra bright LEDs wired in parallel with resistors as per the wizard. But on this one I drilled four holes around the center of the reflector and mounted the LEDs from behind using hot glue. 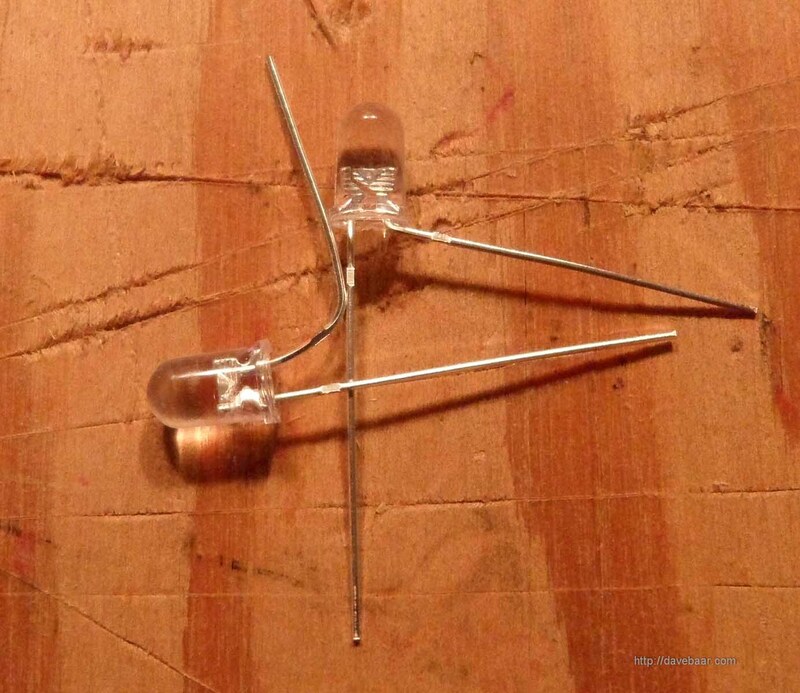 This method puts all the wiring behind the reflector and insures that the LEDs are pointed straight out. Also the incandescent bulb can still be installed along with the LEDs if desired. This approach that makes for a more elegant conversion and puts all the light were its most useful. Not only are the LEDs aimed properly, but since the light is emitted close to the focal point of the reflector there is more added benefit from the reflector. Since reflectors on incandescent bulb flashlights are not designed with LEDs in mind, its only a small benefit though. 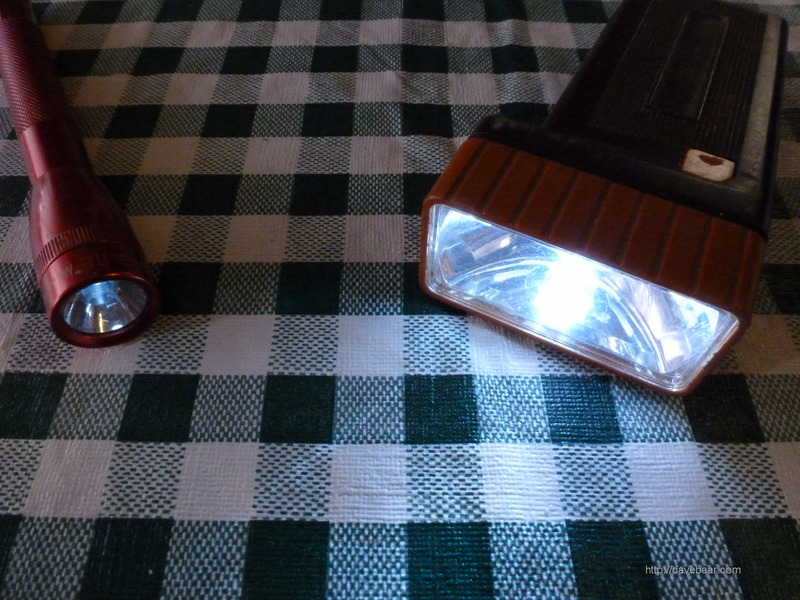 Not sure there is enough space behind the reflector in a 14.4V rechargeable work light for this approach but I would at least consider it if I were to do one again. Thanks again for more useful information and parts sources. A friend of mine in Seattle area has also sourced similar parts from Parts Express. I just edited the main body of the post to reference your comments about the series resistor.